There are lots of perfectly understandable reasons not to like Tom Cruise. His attitude about antidepressants. The Oprah couch-jumping episode. That church he attends. And, outside of his personal life, he's made tons of questionable professional choices, yes. But at 50, Cruise somehow remains a force of nature, a multiplex constant. We can gripe about him all we want, but we'd miss him if he was gone. Ever since he emerged in the '80s, there was something about Thomas Cruise Mapother IV that suggested he was born to be a star. Not an actor—a star. Whether it was Risky Business or Legend or Top Gun, he commanded the screen with his easygoing cockiness. He didn't impress with his depth or craft or whatever other buzzwords acting teachers use. His gift was something more superficial but important nonetheless: Every performance he gave sparked with electricity. For all the acclaim he's received since—including three Oscar nominations—that core component hasn't really changed. Like a lot of stars, Cruise has wanted to prove that he's not just popular but also serious about his work. He's worked for Martin Scorsese (The Color of Money), Oliver Stone (Born on the Fourth of July), Stanley Kubrick (Eyes Wide Shut) and Paul Thomas Anderson (Magnolia). He's done films like Rain Man and Jerry Maguire. And although he's been good in every one of them, the quality of his performances hasn't meant as much as the physical effort he puts into them. Truly, there's no star of his caliber that has so consistently worked so hard to make sure we know how dedicated he is to the business of being a star. It translates into the roles he chooses: He usually plays men who are very, very dedicated to what they do. Take Jerry Maguire, which might be his best role. Every memorable moment from that movie, from "Show me the money" to him giddily singing along to "Free Fallin'" in the car, is about Jerry's absolute desperation to feel something—and for that feeling to translate to an audience. Cruise doesn't mind embarrassing himself to get to a place of real emotion, which is why that final scene in Jerry Maguire works so well. It's a sappy moment, but Cruise owns it. If he had aimed for detached cool, that scene flops. You can call that courage. Or you can just say that the guy never does anything at less than 125 percent. His action movies feed on his freakish intensity. Cruise scaled the Burj Khalifa skyscraper in Ghost Protocol; he has the crazy belief that that's the sort of thing action stars should do. And even when he's safely on the ground, the dude doesn't take it easy. If there was an Oscar for Best Running, Cruise would have won it a couple times, at least. Lots of actors are in chase scenes, but few seem to genuinely love them as much as he does: It's as if he considers them the best way to show how committed he is to the role. And that commitment comes through. We can't but be thrilled watching the guy run for his life. That utter embrace of everything he does gets him into all types of trouble, of course. When he wants to tell Oprah how much he loves Katie Holmes, he really lets her know. When he wants to spread the word about Scientology, he stops at nothing to make that happen. His revved-up laugh, his super-focused interview style: Everything's just a notch above what's normal. That extra oomph makes him seem slightly inhuman, yes. But when he dedicates it to entertaining us, he rarely fails. How is he in Jack Reacher? He's very much Tom Cruise, which is to say that he's not going to let age or logic slow him down. 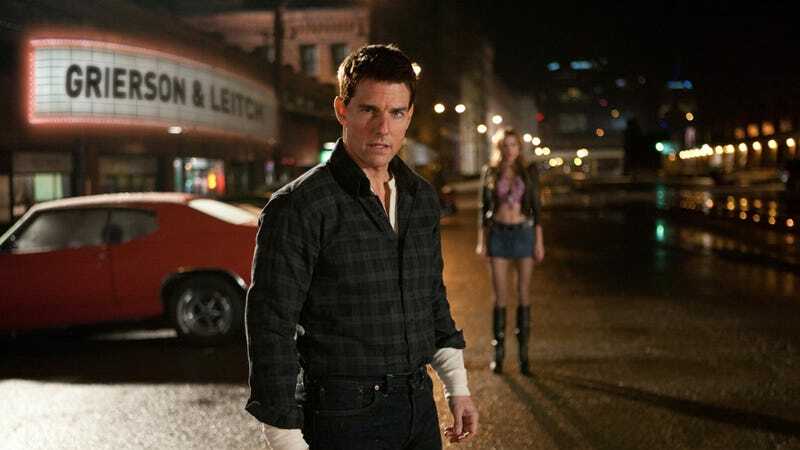 Fans of the Lee Child novels from which the Jack Reacher character is based are furious since the short Cruise is nothing like the hulking character from the books. But if anyone can make the moviegoer overcome that concern, it's Cruise. He simply wills the viewer to accept him as a former military man who now lives like a shadowy hobo. The movie isn't all that great—it plays like an airport novel with creaky plot twists and generic side characters—but Cruise is becoming more fun to watch as he ages. So, yes, his personal life is also getting stranger with age. But I ignore that. Up there on the screen, he just keeps going. He can't run and shoot and scream stuff while running and shooting forever. But, god bless him, he thinks he can.